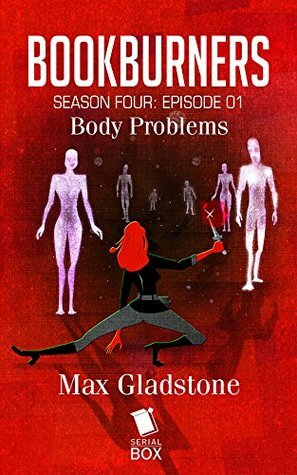 Bookburners: “Body Problems” by Max Gladstone. Season Four: Episode 1. Bookburners is back, and I couldn’t be more thrilled! The end of Season Three left me with so many questions, as well as making some plot choices I adore and have always wanted to see happen in a fantasy. Actually, I’m going to start talking about it. So beware season three spoilers! Season three ended with a huge magical incident in the middle of London. This has always been one of those series where magic is hidden among us (sort of like Harry Potter). Only, now it’s not hidden. People are beginning to realize something is up, even if most of them aren’t saying “magic” or “demons” yet. It doesn’t help that since London, magical incidents have been on the rise all over the world. Team Three is basically trying to bail out the boat with a teacup, but you’ve got to give them a hand for trying. As of “Body Problems,” Team Three has broken with the Vatican. They still have some friends left there who’ll feed them leads, but for the most part, it’s Menchú, Grace, Liam, and Sal, with only each other to rely on. The B-plot, character development subplot of “Body Problems” deals with Grace and Sal. They’re at that awkward point where they’re not quite in a relationship but definitively have something. Now they also have the end of the world hanging over them, which is a real stresser. “Body Problems” starts with the team in a small town in Poland, the home of some historic salt mines. A carving of a book in the mines has become a doorway for magic, and everyone who was down in the mines has turned to salt. The salt mine incident isn’t the primary focus of “Body Problems” (hang on a second for that), but it serves to show both how the world’s changed since last season and how the team is still trying their best, even as they’re being worn down. Menchú wants to offer support and reassurance to them, but he can’t even reassure himself. At the beginning of “Body Problems,” Sal receives a message… via an intelligent raven. It’s from the Marquess, the powerful woman who hosts the annual market and whose garden once ate Liam (well, tried, anyway). She’s calling all of the magical insiders together to figure out this “end of the world problem.” Individually, nobody can do much, but together, they may just stand a chance. It’s a bright moment of hope for the episode… but then a cliffhanger ending throws everything into disarray. Guess I’ll just have to wait for next week to see if a giant, save-the-world team up is still possible.